A guide to the local conditions and precautions that crews arriving by ship or yacht at Tristan da Cunha need to be aware of. The Tristan community will always do everything it can to help those in distress, or who need help with emergency food or fuel. But it will feel less warmly disposed towards those few who, because of poor planning or seamanship, get themselves into difficulties and need to be bailed out (either literally or metaphorically). Tristan Radio acts as a coastal radio station and port control. Visiting vessels should establish contact prior to arrival & during their stay, and advise ETD/proposed destination before departure. All visiting vessels should seek advice from the Harbourmaster on a safe anchorage position (GPS: Lat 37 03.10S/Long 12 18.60W or Lat 37 03.04S/Long 12 17.85W) in the open anchorage below the Settlement (max depth 100m – 50m due to shelving bottom). To comply with wildlife conservation measures, visiting vessels are not permitted to anchor overnight off Gough, Inaccessible or Nightingale Islands. Refurbishment works are planned (2007-09) to deepen Calshot Harbour and extend the breakwaters. Currently, it is too shallow for most boats: maximum depth to the top of the landing steps at low tide is 1.3m. Recommended means of disembarking cruise ship passengers is by Zodiac RIB craft, carried by all visiting vessels. The Harbour is normally closed to visiting vessels after 1900 GMT in summer (1 Oct – 31 March) and after 1700 GMT in winter (1 April – 30 Sept). It is also closed to visitors during early mornings and late afternoons on fishing days, and at other times at the Harbourmaster’s discretion, to permit local boat operations. The Visits Liaison Officer will arrange for an official party to board visiting vessels and complete local clearance procedures prior to the disembarkation of passengers or crew. There is a ban on the import without a permit of any live or dead animals or plants. (*Inaccessible Island is a World Heritage Site, and landings are restricted for environmental and wildlife conservation reasons). 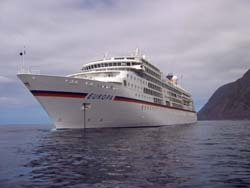 All cruise ship passengers must sign an accident waiver (Passenger Indemnity Declaration) form before coming ashore, and all visitors to Tristan must have adequate travel insurance to cover the costs of any medical treatment including, if required, the costs of medical evacuation to Cape Town. Current medical/dental charges for all non-residents are available on request. Visiting vessels are expected to use their own boats if suitable for use in the shallow harbour. Otherwise a small RIB and crew (£75 per day) can be hired by a visiting yacht, and a ferry boat and crew (£250 per day) for a visiting cruise ship. The Immigration/Police boat is not usually available for hire except by prior approval from the Administrator and Head of Police Department. Subject to prior approval from the vessel concerned, the Visits Liaison Officer will arrange for an official group to come aboard to sell a range of postage stamps and souvenirs to those passengers and crew not going ashore. Permission may also be sought for a party of local schoolchildren to tour the visiting vessel. If weather or sea conditions prevent the disembarkation of passengers, but still permit operations by local boats, the Visits Liaison Officer may arrange for an official group to board to sell postage stamps & souvenirs. Ships are invited to contact tristandc.com Webmaster Peter Millington on webmaster@tristandc.com to post notice of a ship's arrival, and to send a report, with JPEG files for the website and Tristan da Cunha Newsletter. Shipping companies may also request a link to their websites in return for a link to tristandc.com in the interests of mutual benefit. Visiting crew and passengers are likely to be enthralled by the Tristan community and want to keep in touch and find out more. 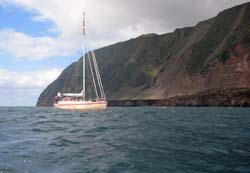 The UK based Tristan da Cunha Association produces two 40 page full colour newsletters each year and organises events, including a residential Annual Gathering. Join us by checking out the Tristan Association pages.